Earlier this week, we showed you the first in a series of prequel comics that help set the stage for next month's highly-anticipated Batman v Superman: Dawn of Justice, which fans can find in boxes of General Mills cereals. The first prequel comic entitled "Field Day" offered new clues about Superman's secret weakness. Today, Comic Book Movie has discovered five more prequel comics, which each focus on one character. 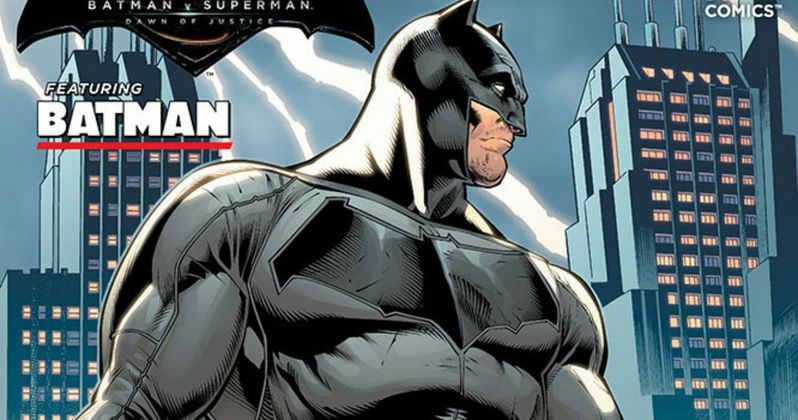 These comics offer new details about Batman (Ben Affleck), Lois Lane (Amy Adams), Senator Finch (Holly Hunter), Superman (Henry Cavill) and Lex Luthor (Jesse Eisenberg). All of these comics were written by Christos N. Gage (Legends of the Dark Knight, Thunderbolts) and penciled by Joe Bennett. The Batman comic features the villain Firefly, who is trying to break into a building to set it ablaze. This story offers a few subtle clues about this aging crimefighter, with one of Firefly's thugs mentioning that he has gotten more brutal with age, and he is more inclined to use intimidation tactics. Shortly after Ben Affleck was cast, we had heard that this version of the Dark Knight would be more "weary" after fighting crime in Gotham for several years. The Lois Lane comic ties into the Battle of Metropolis in 2013's Man of Steel, where the Daily Planet reporter confronts the CEO of Hanford Industries about his shady dealings after the battle. It is eventually revealed that Lex Luthor was buying Hanford Industries, and that he plans to keep the Kryptonian technology they've discovered for himself. There have been several rumors that Luthor will use this Kryptonian tech to create the massive Doomsday, who was revealed in the latest trailer. The Senator Finch comic is set at a meeting of the Senate Subcommittee on Emerging Threats and Capabilities, where Finch learns that Superman could destroy half the population of Metropolis within a half-hour, if he really wanted to. The meeting ends with a vote to "study" the Man of Steel. The Superman comic centers on a panel discussion where several analysts are breaking down the destruction of Metropolis during the epic final battle in Man of Steel. This comic seems to echo many concerns actual fans had about the ending of Man of Steel, and how destructive it really was, which helps create the conflict between the title characters in Batman v Superman: Dawn of Justice. We discover at the end of the comic that Lex Luthor is, again, watching this unfold, as he's popped up in all of these comics so far, leading to his own prequel comic. The Luthor comic shows this billionaire speaking at a press event, where he's being called a hero for leading the efforts to rebuild Metropolis, causing other corporations to stay in Metropolis after initially planning on leaving after the disaster. The comic also shows Lex talking to his assistant, Mercy Graves (Tao Okamoto), revealing he doesn't know enough about Superman yet, before it's revealed that he has an entire room filled with monitors, devoted to the Man of Steel. It doesn't seem that these comics are related to the General Mills books since our report from this week revealed that there are only three more comics in that series which will be unveiled soon. Regardless, these comics shed plenty of light on these five important characters and what they're up to before the story unfolds in Batman v Superman: Dawn of Justice. While we wait for more details, take a look at these comic books below, and chime in with your thoughts.